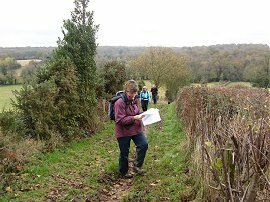 We did this walk on Sunday 7th November 2009 with a full set of ten walkers, photo 1, setting off from Limpsfield Chart where we had ended the previous stage of our walk along the Vanguard Way. 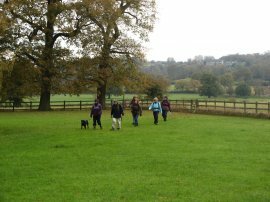 It was a rather dull and grey day, not very conducive for taking many photos, however the rain held off for the duration of the walk. (3) Path nr Hole Lane? Leaving the parking spot by St Andrews Church we headed over Kent Hatch Road to joins a track that runs downhill towards Trevereux Manor. 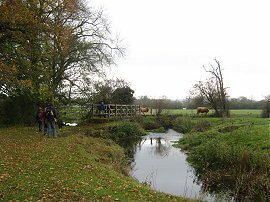 Just past the house the route joins a footpath that heads over an open grass covered field towards the small Kent Brook. On the grass there were a couple of flocks of Canada Geese although a bit to far away to get a decent photo. Once over the brook the route heads over small section of field before passing through a kissing gate into a paddock, photo 2, besides a house from where the route joins Dairy Lane. Turning left along the road, the route soon joins a footpath on the right that runs along the edge of a field towards a small area of trees where the route turns briefly to the left before continuing ahead along a path with trees of Guildables Wood to the right and fields to the left. Somewhere on this stretch of path I took photo 3 and we also stopped for two minutes silence at midday as the day was also Remembrance Sunday. The route then crosses a small section of open ground to reach Hole Lane. The Vanguard Way crosses the road and joins a footpath a few yards up the road that runs alongside the edge of two fields before joining a tree lined track. This track is then followed to reach Troy Lane on the outskirts of Troy Town. Troy Lane is then followed down to Hilders Lane where the route heads off to the right. The lane almost immediately bends to the left to cross over two sets of railway lines in quick succession before reaching Honeypot Lane where the route once again heads to the right. Just after the road crosses back over Kent Brook the route joins a footpath on the left that runs parallel with the driveway to a farm. 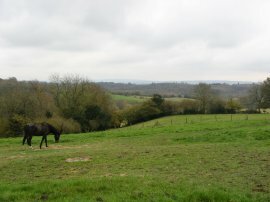 This section of field had been sub divided into a number of separate paddocks which was populated by a number of rather inquisitive horses and also meant there were a number of stiles to cross over. Leaving the paddocks the route heads over a number of other fields towards Shingle Barn Farm where the footpath heads through a small section of field to reach Dwelly Lane. 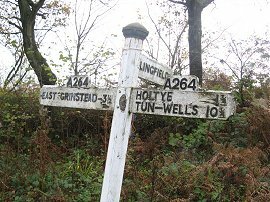 The route then follows the road for about a mile before eventually reaching the road junction with Haxted Lane where the route turns to the right. 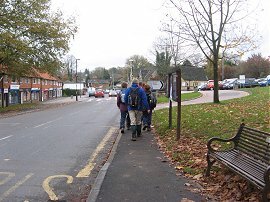 A short distance further on the route passes Haxted Mill, photo 4. When in use the mill used to be powered by the River Eden and at this point the Vanguard Way finally leaves the tarmac and joins a footpath that runs alongside the river Eden, photo 5. Crossing over the river the path heads over a grassy field to reach Starborough Road. Here we headed to the left along the road until the road turns sharp right where we joined a footpath that runs ahead over fields towards the driveway leading to Cernes Farm. From Haxted we had been following the route of our rather snowy walk along the Eden Valley Walk earlier in the year, the route of which officially ends at Cernes Farm to allow it to link up with the Vanguard Way. 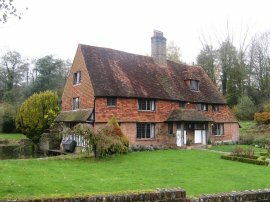 We then headed to the right along the driveway, passing by the buildings of Starborough Castle which were fairly well hidden from the path, before taking a footpath on the right that heads diagonally across a field to Moor Lane, photo 6. At Moor Lane we turned to the right for a short distance before joining a track that leaves the road to the left besides a group of cottages which is where we stopped for our lunch break, not the most picturesque of locations but time was getting on and there had been rather a lack of more pleasant places to stop and eventually hunger won the day. Having eaten we continued along the path which ran between fields before passing through a small patch of woodland and then along the edge of another patch of woodland to join a track. 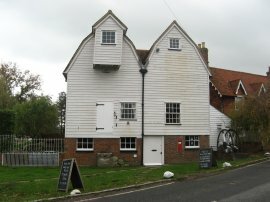 Here the route turns to the right for a short distance, briefly linking up with the route of the Sussex Border Path, before turning to the left along a track by Dry Hill Farm. The route had been heading steadily uphill for some distance and the top of Dry Hill was marked by a trig point at 172 mtrs of height. 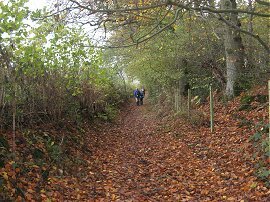 The path then begins heading downhill, skirting around the buildings of Beeches Farm to join a tarmac track that heads downhill past Woodlands Farm to eventually reach Smithers Lane. Here we turned to the right, following the road past the very attractive house in photo 8, up to Shepherdsgrove Lane. 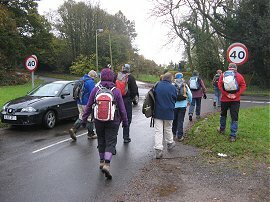 At Shepherdsgrove Lane we headed to the left following the road up to the A246 Holtye Road, photo 9. The Vanguard Way then heads straight across the main road to join a driveway that heads downhill. Where the driveway bends to the right the route joins a footpath on the left that heads alongside a field edge besides a path of woodland. At the end of the field the route turns to the right, following a path that heads towards Wet Wood. 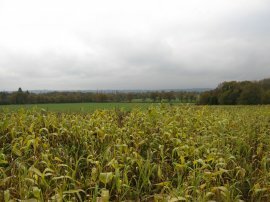 There were occasional views across the undulating countryside but this seemed a rather uninteresting part of the walk. Leaving the woodland the route crosses a small stream and joins a hedge lined track that leads uphill away from the wood, photo 10. Towards the top of the hill the route turns to the left along a lane that takes a fairly level course for about a mile before turning to the left along a track by some isolated cottages. The route soon joins another track on the right that runs between fields to reach Cansiron Lane. Here the route continues ahead before joining a tree lined footpath where the lane bends to the left. 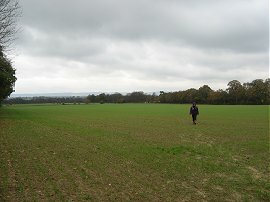 The route then follows a more of less straight course, between fields and through the occasional small patch of woodland, as it starts descending towards the end of the stage at Forest Row, photo 11. The route heads past a pond on the left before continuing ahead to reach a water treatment works. Here the route crosses a track into a car park of a small industrial estate, heading slightly to the left to join station Road which we then followed up to our parking place. Reaching the cars at Forest Row we had walked 13.5 miles. My abiding memory of this stage of the Vanguard Way was the amount of tarmac we had to walk on during the day and all in all it was probably one of the less memorable walks I have done recently, a perception no doubt influenced by the dull grey weather.